The Daily GRRR! HEADLINES for Dec. 22, 2014. 1. Peru plans to press charges against Greenpeace for destructive stunt. 2. Canadian developers literally stealing indigenous lands in Honduras. 3. BC First Nation may file mining injunction after tailings pond spill. 4. UN urged to declare Canada’s genocide against indigenous peoples. 5. Palestine sets deadline on Israel’s settler-colonial occupation. 6. Cop fired for stopping fellow cop from choking handcuffed suspect. 7. WPIRG fights for the rehiring of unjustly fired UW food service worker. Welcome back to SoundFM! You are now listening to The Daily GRRR! heard every weekday from 9-10 a.m. here on the airwaves at 100.3fm, CKMS in Waterloo, Ontario, and SoundFM.ca on the web. This is Kathryn and I’ll be your host on this Monday morning show for December 22, 2014. As always, we are broadcasting from the heart of the Haldimand Tract, the occupied Grand River Territory of the Six Nations, which we continue to recognize as Haudenosaunee land. The Daily GRRR! is a project of the Grand River Media Collective and is supported by the Community Radio Fund of Canada and CKMS. 1. Peru plans to press charges against Greenpeace for destructive stunt In the words of Gizmodo writer Adam Clark Estes, Greenpeace can get a little aggressive with its tactics but that doesn't mean that it's not fighting for a good cause. However, after the organization marched through the sacred Nazca Lines etched into the Peruvian desert for a climate protest, capturing it all on camera with a drone, you have to wonder what the hell they were thinking. According to Peru’s culture ministry, the activists had entered a strictly prohibited area beside the figure of a hummingbird among the lines, and they had laid down big yellow cloth letters reading “Time for Change! The Future is Renewable” as the UN climate talks were beginning in the country’s capital city of Lima earlier this month. Peru’s vice-minister for culture has since accused the Greenpeace protesters of flagrantly ignoring what the Peruvian people consider to be sacred and has said the government is seeking to prevent those responsible from leaving the country while it asked prosecutors to file charges of attacking archaeological monuments, a crime punishable by up to six years in prison. 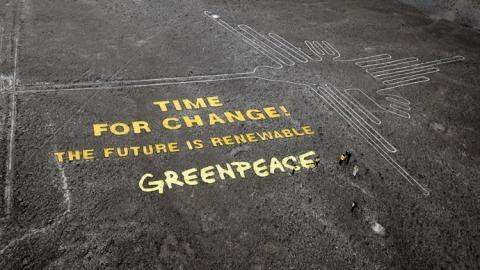 The organization has since made a public apology for their thoughtless actions, saying “Without reservation Greenpeace apologises to the people of Peru for the offence caused by our recent activity laying a message of hope at the site of the historic Nazca lines. We are deeply sorry for this. Rather than relay an urgent message of hope and possibility to the leaders gathering at the Lima UN climate talks, we came across as careless and crass.” These humble words are of little consolation in light of the crime. Aside from the blatant insensitivity at play, the reason Greenpeace's actions were so atrocious has everything to do with how fragile the drawings and surrounding ecosystem are. The Nazca drawings, a UNESCO World Heritage Site, date back to between 400 and 650 AD, when the area was inhabited by the ancient Nazca culture. The Nazca people created them by digging long, shallow trenches that became figures—spiders, monkeys, fish, birds, etc.—when viewed from above. They stand out from the rest of the landscape because the gravel on top of the soil is dark, but when the rocks are removed, light-colored clay is exposed. And these Greenpeace activists stomping onto the site had the effect of walking across a wet painting. In a video released earlier this week, Greenpeace international executive director Kumi Naidoo strongly condemned the local Greenpeace activists' actions and issued an apology to the people of Peru, admitting that “Greenpeace should never have done the activity at the Nazca Lines. We made a mistake. We must now commit our full attention to making amends. This is not who we are. This is not what we stand for.” However, this retrospective humility from the organization as a whole hasn’t stood in the way of the Peruvian government pursuing legal action, and we can only hope that Greenpeace and its many activists worldwide will learn from this serious and costly mistake. 2. Canadian developers literally stealing indigenous lands in Honduras As reported by journalist Sandra Cuffe, the Garifuna community of Guadalupe sits at the western edge of the Trujillo Bay in northeastern Honduras, where lush rainforest-covered mountains meet the Caribbean Sea. More than three-quarters of the community’s 237.75 hectare land title, though, has been illegally sold and taken over. Canadian developer Randy Jorgensen’s Alta Vista residential project overlaps with the westernmost part of the community title, covering both mountain slopes and beachfront. Alta Vista and other projects have taken over stretches of coastline. Walking along the beach between communities in the Trujillo Bay is no longer possible for local residents. Security booths, guards and fences have sprung up with the new real estate developments. One of the most recent scandals in Guadalupe, though, is that the developers have been stealing the community’s lands — not just in the sense that the project overlaps with the collective land title, but in a much more literal sense. Backhoe operators working at the Alta Vista project have driven the short distance down the road from the project to the edge of the residential center of the community and excavated sand from a number of community plots, without permission, consultation, or even warning. Some of the hills in and around Guadalupe have a gravelly kind of sand that is useful for fill in marshy areas, but their excavation is jeopardizing the subsistence crops cultivated by the community’s own residents. The extraction of earth from Guadalupe community members’ plots is a minor incident in the face of the large-scale land grabs for tourism and residential development projects in the area. But the blatant and very literal theft of community lands is revealing as a microcosm for the take-over of collective Garifuna territory in the Trujillo Bay. 4. UN urged to declare Canada’s genocide against indigenous peoples As reported by The Huffington Post, a fresh campaign is underway to push the United Nations to officially recognize and label Canada's treatment of First Nations people as genocide. Last Monday, former National Chief Phil Fontaine, elder Fred Kelly, businessman Dr. Michael Dan and human rights activist Bernie Farber sent a letter to James Anaya, the UN’s special rapporteur on the rights of indigenous peoples, arguing that several specific crimes against aboriginal people in Canada qualify as genocide under the post-Second World War Convention on the Prevention and Punishment of the Crime of Genocide (CPPCG). Article 2 of the Convention states that "genocide means any of the following acts committed with intent to destroy, in whole or in part, a national, ethnical, racial or religious group, as such: (a) Killing members of the group; (b) Causing serious bodily or mental harm to members of the group; (c) Deliberately inflicting on the group conditions of life calculated to bring about its physical destruction in whole or in part; (d) Imposing measures intended to prevent births within the group; (e) Forcibly transferring children of the group to another group." The letter writers assert that at least three actions on the part of Canadian governments constitute genocide under those rules: 1. Sir John A. MacDonald's policy of deliberately starving First Nations people to make way for settlers in the Canadian west. 2. The residential school system and especially the decision of Department of Indian Affairs chief Duncan Campbell Scott not to address rampant tuberculosis among students. 3. The forcible removal of aboriginal children from their homes for the purpose of adoption by white families, a practice known as the "Sixties Scoop." Estimates put the number of children removed between the 1960s and the mid 1980s at around 20,000. Farber and Dan have previously argued that the recently revealed nutrition experiments performed on children at residential schools also qualify as genocide. 5. Palestine sets deadline on Israel’s settler-colonial occupation As reported by Al Jazeera, the country of Jordan has submitted a draft resolution to the UN Security Council for a possible vote on ending Israel's occupation of Palestinian lands captured in 1967. The resolution wants Israeli security forces withdrawn no later than the end of 2017. Palestinian UN Ambassador Riyad Mansour said on Wednesday that the Arab-backed resolution does not close the door on further negotiations on the issue, including with the United States. As he explained, "We will continue negotiating with all of them and with the Americans if they are ready and willing so that we perhaps can succeed in having something adopted by the Security Council to open a serious door to peace… We are willing to work with those who want to work with us for meaningful things." Jordan submitted the resolution on behalf of the Palestinians since Palestine is an observer to the UN and not a full member state, and only member states can present a resolution to the Security Council. The draft resolution calls for peace between Israel and the Palestinians within one year that "fulfills the vision of two independent democratic and prosperous states." France, Britain and Germany are also drafting a resolution, which French Foreign Minister Laurent Fabius said would propose concluding peace talks in two years. The draft resolution states that a negotiated solution should be based on several parameters including the 1967 borders, security agreements, and "Jerusalem as the shared capital of the two States which fulfills the legitimate aspirations of both parties and protects freedom of worship." 6. Cop fired for stopping fellow cop from choking handcuffed suspect As reported by the Free Thought Project, former Buffalo Police Officer, Cariol Horne has been fighting for her pension since she was fired after 19 years on the force, over an incident in 2006 when she stopped a fellow officer from choking a handcuffed suspect. Horne had received a call that Officer Gregory Kwiatkowski was at the scene of a domestic dispute and in need of assistance. When she arrived, she witnessed Kwiatkowski violently punching the handcuffed suspect in the face. Horne and other officers on the scene removed the suspect from the house, but once outside Kwiatkowski pounced again, this time choking the handcuffed man. Believing Kwiatkowski to be out of out of control, Horne removed his arm from around the man’s neck. Infuriated that she had crossed the thin blue line, Kwaitkowski then punched Horne in the face. The punch so was hard that Horne ended up having to get the bridge of her nose replaced. She was then injured again as officers dragged her away from trying to defend herself. Worse still, Horne ~ who was trying to stop abuse by her peer ~ was subsequently fired for “jumping on Officer Kwaitkowski’s back and/or striking him with her hands,” something that Kwaitkowski himself denied ever happening in a sworn statement. By contrast, however, this male officer with a history of violence has been allowed to keep his job. It wasn’t until he choked another officer at a district station house that he was forced to retire. He was already under investigation for punching another officer while he was off-duty at a local bar. Moreover, in May of this year Kwiatkowski and two other officers were indicted for civil rights violations against four black teenagers, just days before the statute of limitations was due to expire. Kwaitkowski is accused of using excessive force while the victim was already under arrest. His fellow officers then shot at a handcuffed teenager with the teen’s own BB gun, after the boy was already handcuffed and in the back seat of their police vehicle. In the majority of police brutality incidents that come to light, there are other officers present and allowing it to happen. Unfortunately, with departments throughout North America upholding their reputation of vilifying anyone who dares to cross the thin blue line, it’s no wonder there is such a shortage of police willing to speak out against the atrocities we have been witnessing.